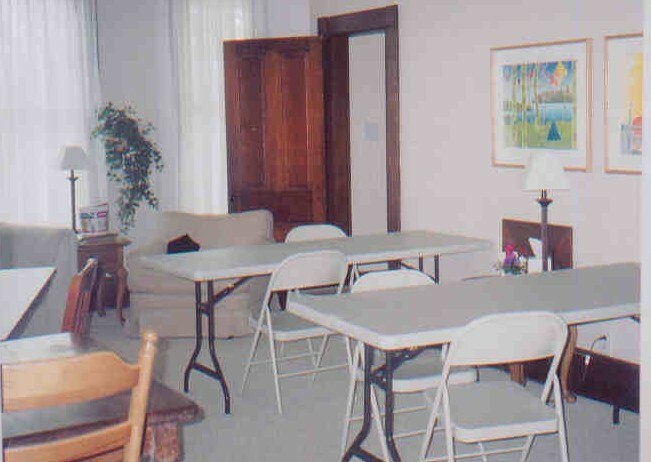 Stratton House Inn is an ideal location for scrapbooking consultants, stamping consultants and quilting consultants in Ohio, Indiana, Pennsylvania, West Virginia and Kentucky to schedule a retreat for their current and potential customers. Also, when consultants wish to get away with fellow consultants, Stratton House Inn is where they come. Weekend campers have plenty of room to spread out -- but still be surrounded by others who stimulate, inspire and encourage each other. And scrapbookers, stampers, and quilters can take inspiration from the woods, meadows, and park that surround the house -- or from the many original works of contemporary art on the walls of Stratton House Inn. Most scrapbooking consultants, stamping consultants, and quilting consultants who hold retreats at Stratton House Inn, bring customers from their home areas. However, as an added bonus, Stratton House Inn begins advertising your retreat in its Schedule of Events as soon as you establish a time for your retreat. Because of the number of scrapbookers, stampers, and quilters that visit the Stratton House Inn website, this schedule helps direct other potential customers to you. The Inn is conveniently located about one hour west of Pittsburgh, two hours east of Columbus, two hours south of Cleveland, and two and one-half hours north of Charleston, WV. Stratton House Inn will sleep 16 adults comfortably, and will generously accommodate approximately 12 scrapbookers, stampers or quilters. 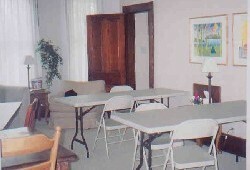 More creative-retreat campers can be accommodated, but auxiliary areas -- such as the Parlour and Office -- rooms not normally used for such purposes, will need to be employed. If you are a scrapbooking consultant, stamping consultant, or quilting consultant, please contact us to reserve your special weekend. If you would like to attend a scrapbooking, stamping, or quilting weekend sponsored by a consultant, please see Schedule of Events for the next-scheduled "open" creative-retreat weekend. 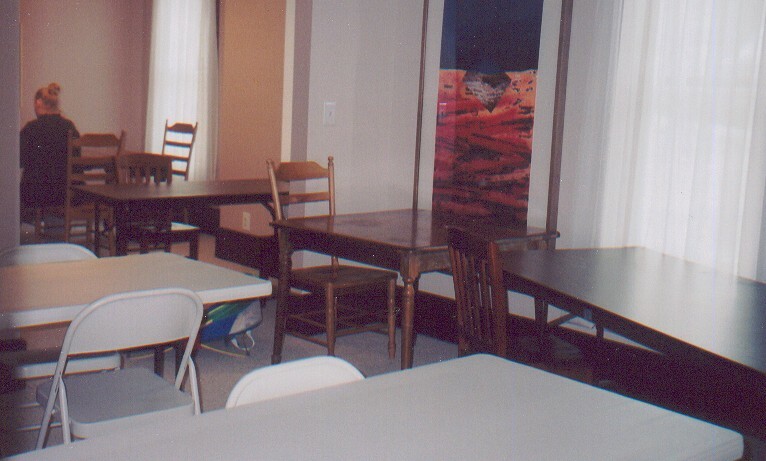 Captions: top: View from the Sitting Room looking toward the Dining Room, showing tables set up for a scrapbooking weekend. This configuration will accommodate 14 persons, with no more than two persons sharing a long table. bottom: Another view of the Sitting Room. With its bay window, the Sitting Room is bathed with natural light even on cloudy days. Click photos for larger versions.